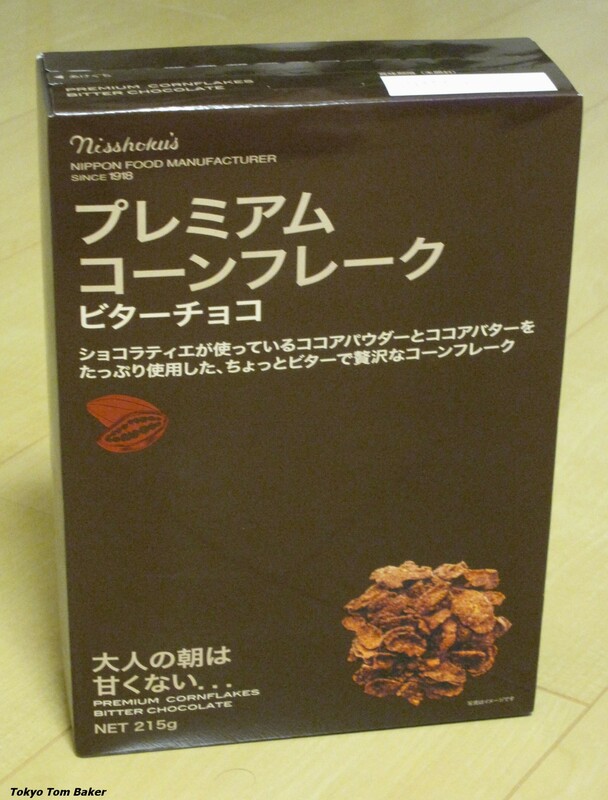 Is there any food that a bit of Japanese culinary innovation (and stylish packaging) can’t turn into a gourmet item? During a recent visit to the supermarket, I discovered two cases in point: “adult” chocolate cornflakes and also potato salad redesigned as a festive dessert. 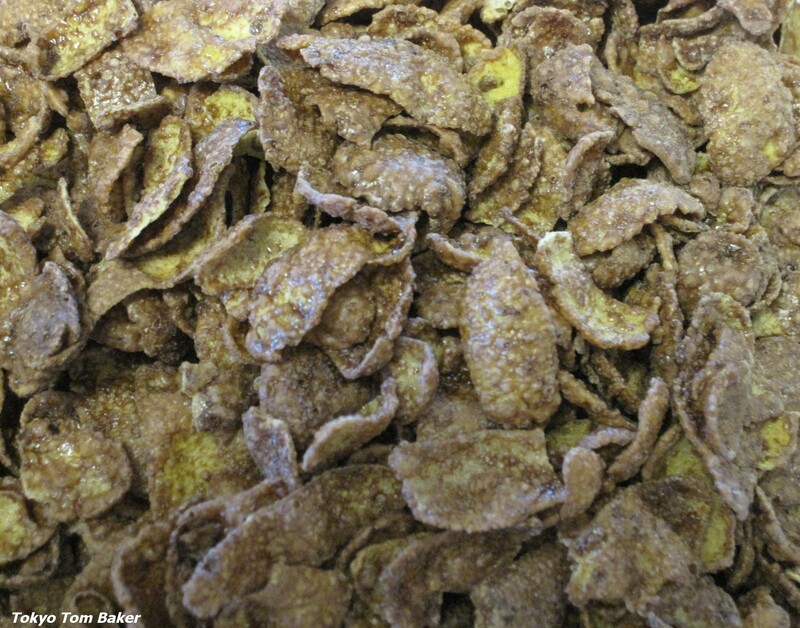 The cornflakes made me laugh when I first saw them. The spare, uncluttered design of the box, consisting mainly of a glossy brown background with a small photo of a sample of the product discreetly tucked away in the lower right corner, looks like something that would blend in perfectly if you happened to leave it on a table in the lounge of a luxury hotel. The listed ingredients are corn, sugar, cocoa powder, cocoa butter, whole powdered milk, salt, cacao mass, barley extract and an emulsifier. I bought it the other day and poured myself a bowl this morning. I was shocked. It’s delicious! As promised on the box, it is not sweet at all. The bitterness of the chocolate is surprisingly strong. I’ve never experienced this flavor in a breakfast cereal before. As tasty as it was by itself, I couldn’t help thinking that I would have enjoyed it even more with a sliced banana or some fresh berries on top – and moreover, that this cereal would complement fresh fruit much better than non-bitter cereals do. What I had thought was merely an amusing packaging gimmick turned out to be a good and genuinely innovative product. Wow. The potato salad dessert didn’t impress me as much. I liked the concept right off the bat. The product looks appetizing (or at least eye-catching), and its main ingredients (with one mysterious exception) all sounded appealing. 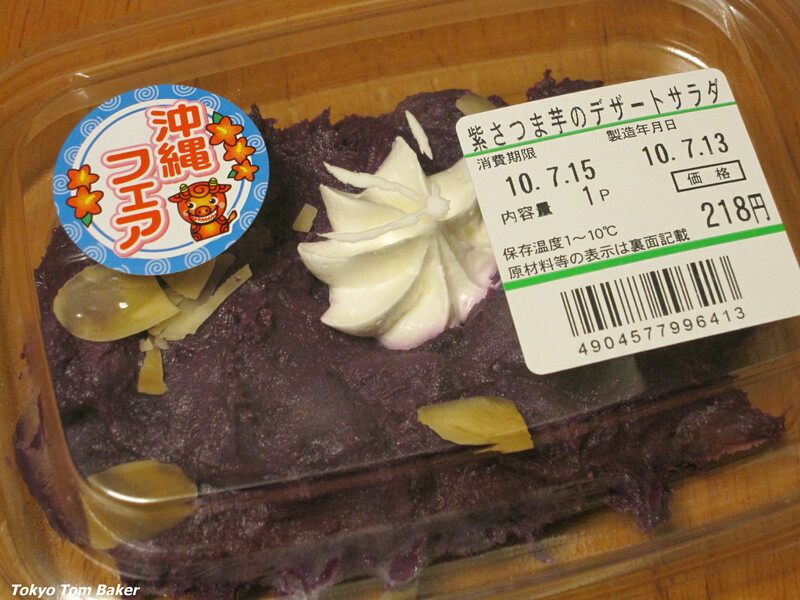 The listed ingredients are murasaki imo (Okinawan purple potatoes), satsuma imo (sweet potatoes), hankotaijo dressing, mayonnaise, honey, whipped cream, sugar, almonds, and – at the bottom of the list – the usual handful of unpronounceable preservatives and colorings. Ignoring the last few items and focusing on the first few, it sounds pretty good. But what is “hankotaijo dressing”? It literally translates as “semicongealed dressing” or“semisolid dressing.” But it seemed to me that mayonnaise is also a semisolid dressing, so why are it and hankotaijo dressing listed separately? The Japanese-language website mayonnaise.org sheds a little light on this question with its dressing taxonomy chart. (To see it, click the top link under “Story of Dressing.”) The genus of dressings called “hankotaijo” includes at least three distinct species: mayonnaise, creamy salad dressing, and … wait for it … “hankotaijo.” Hmm. This brings us right back to where we started. 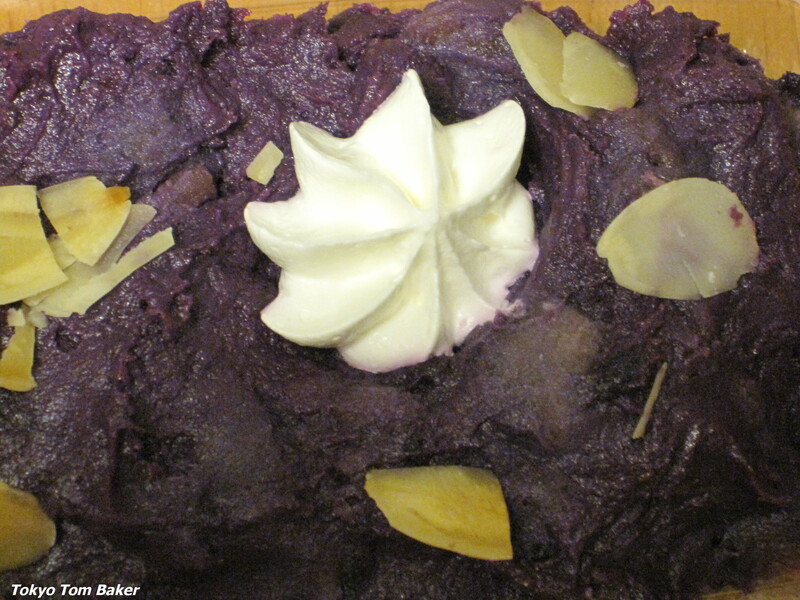 Anyway, I went ahead and tasted the dessert potato salad, and found it much less sweet than I had expected. In fact, it was rather bland – surprisingly so considering that the ingredients include both sugar and honey. The whipped cream appears to be limited to a decorative dollop in the center of the serving, and the most enjoyable parts were when I had a little whipped cream on my spoon along with the other ingredients. The dish was extremely thick, pasty and heavy, which is another point against it. Since desserts are meant to be eaten after meals, they ideally should be light in weight and texture (if not in calorie count). To wrap it up, I will definitely by the adult cornflakes again, but once was enough for the dessert potato salad. In 1998, former U.S. President Jimmy Carter wrote a guest column for Businessweek magazine about how he was spending his retirement years. Among other things, he had climbed Mt. Fuji. I missed the article when it first came out, but a year later I happened to spot a framed Jimmy Carter autograph on the wall of a cement hut near the summit. It might still be there, so if you want to look for it yourself, all you have to do is climb Mt. Fuji. The words “all you have to do” are highly misleading, but the illusion of ease is part of Fuji’s mystique. 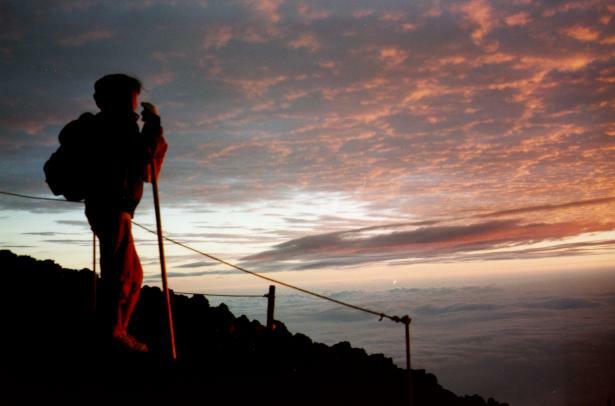 Countless people injure or humiliate themselves every year because of the myth that climbing Fuji is a breeze. 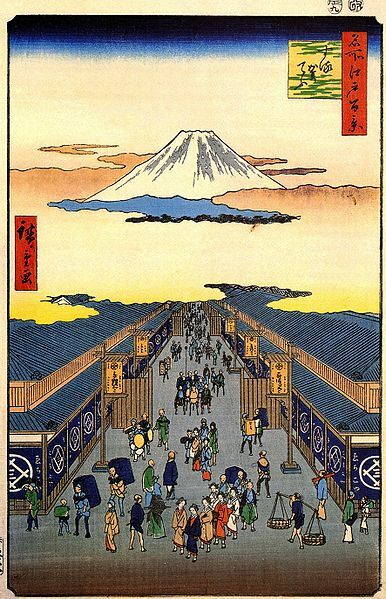 Blame Hiroshige: He made it look like Mt. Fuji is just a few steps down your local shopping street. According to a recent article in The Daily Yomiuri, nearly 300,000 people made the trek up the slopes in 2009. Last year also saw a record 2,085 mountain-climbing injuries in Japan, with many more presumably unreported. The mountain can be seen from nearly everywhere on the Kanto Plain. 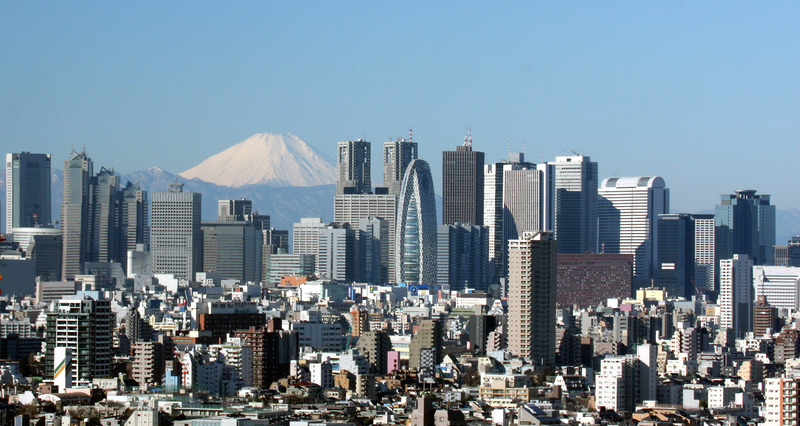 I personally have seen Fuji on a clear day from as far away as Chiba City, even though Tokyo Bay, the city of Tokyo, and a number of smaller peaks occupy the intervening 130 kilometers. 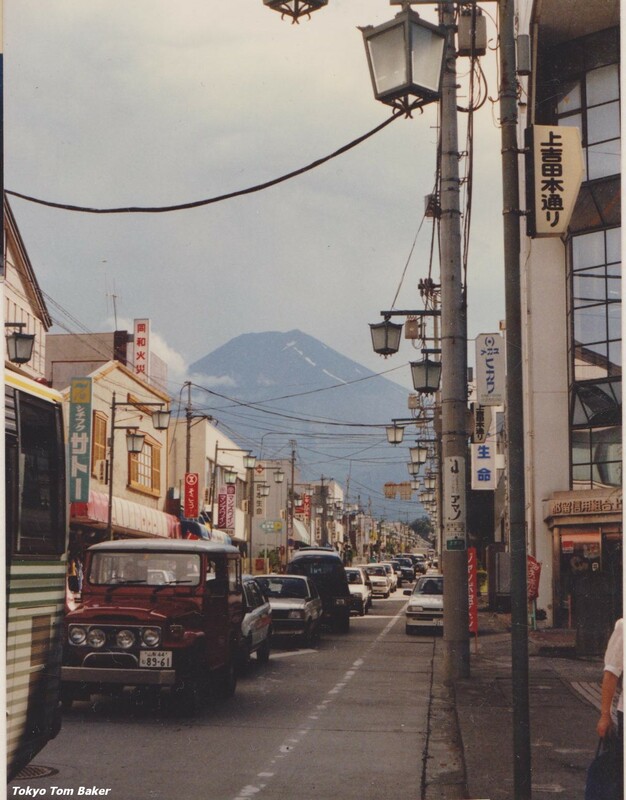 Smog usually keeps Fuji hidden, but it must have been an everyday presence in the days of cleaner air. It appears to be very close, when in fact it is just very big. Another deceptive aspect of Fuji is its shape. From a distance, it is a perfectly smooth and gently sloping cone that has been immortalized in countless artworks. Close up, though, it is just a big old nasty volcano. Also, Fuji is the only mountain with its own propaganda brigade. 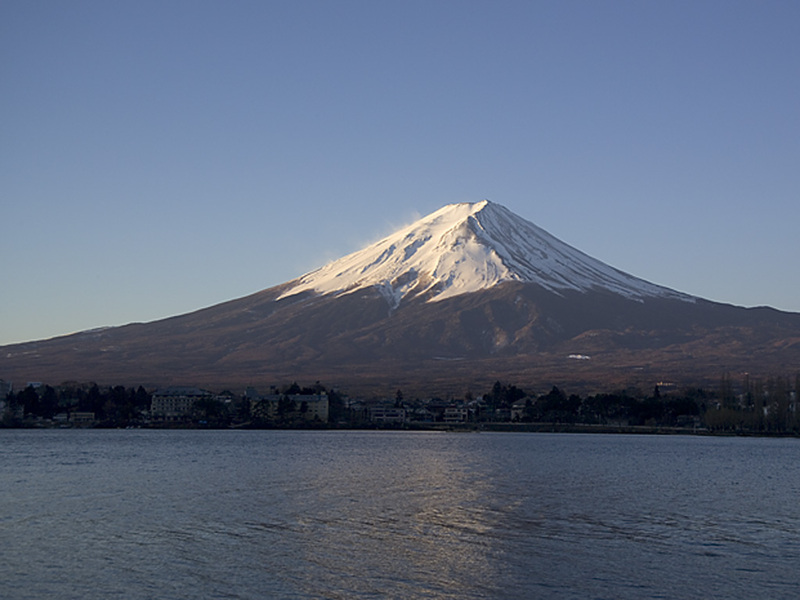 There’s a persistent myth, repeated in countless travel books, that Fuji can be climbed in about five hours. The more brazen of these publications even describe diminutive grandmothers with dried-apple faces who achieve the summit with a spring in their step. The “ideal” climb, everyone says, is made at night. This way, the barely-winded climbers on top of Mt. Fuji can be among the first in Japan to see the following day’s sunrise as it emerges from the Pacific. In 1989, I stepped out of the train station, saw this view, and started walking. The first time I fell for this line was in 1989, when I was young and strong and foolish. With very little advance planning, I just took a train to Fujiyoshida — the town nearest the base of Mt. Fuji — and set out on foot. Only later did I realize that the five-hour figure I had heard so much about applied to travelers who took a bus halfway up the mountain and then began to walk. I left Fujiyoshida Station at 4 p.m., intending to arrive at the top around 9:00 that night so I could get plenty of sleep (there are bunkhouses for that purpose) before viewing the legendary sunrise the next day. As it happened, I didn’t reach the summit until 6 a.m, two hours after sunrise and fourteen hours after I began my climb. I missed the sunrise because I was on the north-northwest slope of the mountain at the time. However, the thin air at 3,776 meters above sea level brought me as close to the sun as I ever care to be. I got such a ferocious sunburn that one of my Japanese acquaintances later remarked in all sincerity that he had never seen a human being of that color before. Still, I had made it. My bragging rights were secure, and they would be safe as long as I remembered the Japanese proverb that everyone should climb Mt. Fuji once but only a fool does it twice. In 1999, I found myself to be 10 years older, 15 kilograms heavier, and every bit as foolish as I was in 1989. So, when my friend Denton Venable asked me if I’d climb Mt. Fuji with him, I agreed to do it. After all, I thought, I had learned from my mistakes the first time, and this time we could do it right. For one thing, viewing the Fuji sunrise was out of the question. I could stay up all night or I could climb the tallest mountain in Japan, but I was not about to attempt both feats simultaneously at what I then thought of as the creaky old age of 32. Taking the Fujikyu bus seemed like the best way to start. It leaves from a terminal outside of the west exit of Shinjuku Station in Tokyo and goes directly to Gogome, or the Fifth Station, halfway up the mountain. The drive is just under three hours long. Taking the day’s first bus at 7:45 a.m. would have us climbing before noon. We’d have enough daylight left to make the five-hour climb and then come back down in time for dinner in Tokyo. As high as it is, the Fifth Station is still just below the tree line. It probably took us an hour just to clear the trees, in part because the path away from Gogome is mostly horizontal and actually descends at first. The Sixth Station, Rokugome, is only slightly higher than Gogome. This reinforces the illusion that climbing Mt. Fuji is going to be easy. At the Sixth Station, we met a beagle wearing socks. This was to protect the pads of her paws from the abrasive volcanic gravel. Her owner told us that the beagle had climbed as far as the Eighth Station. Hey, if a goofy little dog could make it that far, then two healthy guys like us were going to have no problem. From there, the path begins to zigzag lazily up the mountain. At this altitude it is no longer a trail through the woods but rather a broad gravel lane held in place by retaining walls. It is only moderately steep. This part of the climb can be a little tedious, but it’s not rough. Somewhere above the Seventh Station conditions begin to change. 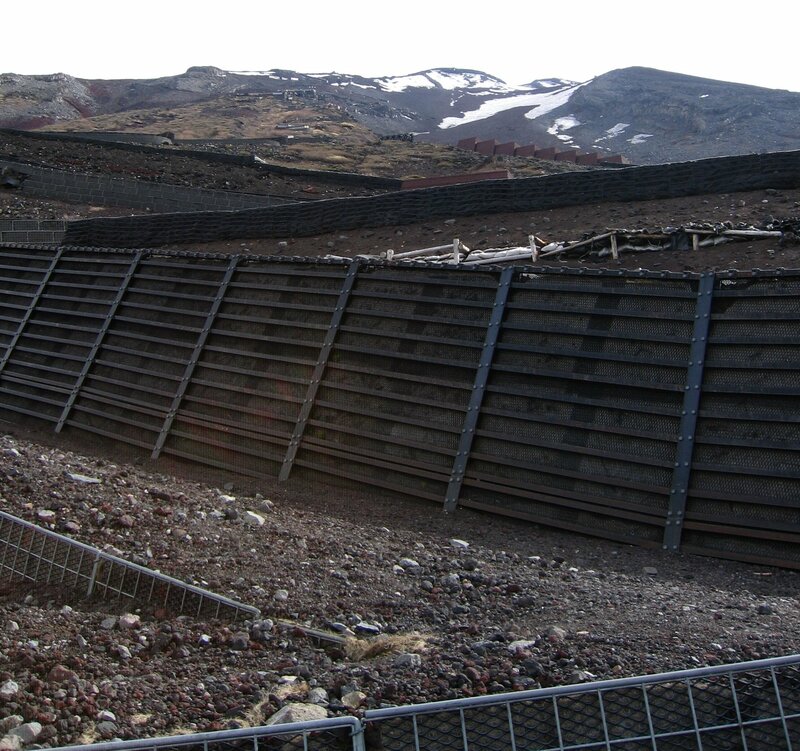 The straightaways between switchbacks become shorter and less straight. There’s less gravel and more rocks. There’s less walking and more climbing. The summit is still very far away. In other words, the trail begins to get difficult just as most people are beginning to feel tired. It was here that we encountered an angry-looking woman heading downhill against the flow of traffic. (Most of the paths on Mt. Fuji are officially one-way.) She was followed a moment later by her embarrassed-looking husband or boyfriend. When he caught up with her on a ledge below us, the two of them were backlit by the sun and silhouetted against a misty view of the smaller mountains around us. They would have made a beautifully romantic scene if not for the fact that she had her arms stubbornly folded and her head tucked between her shoulders and his pose looked imploring. It wasn’t hard to guess whose idea this climb had been, and who had had enough of it. As we left them behind, their conversation didn’t sound happy. Fuji had claimed its first casualties of the day. 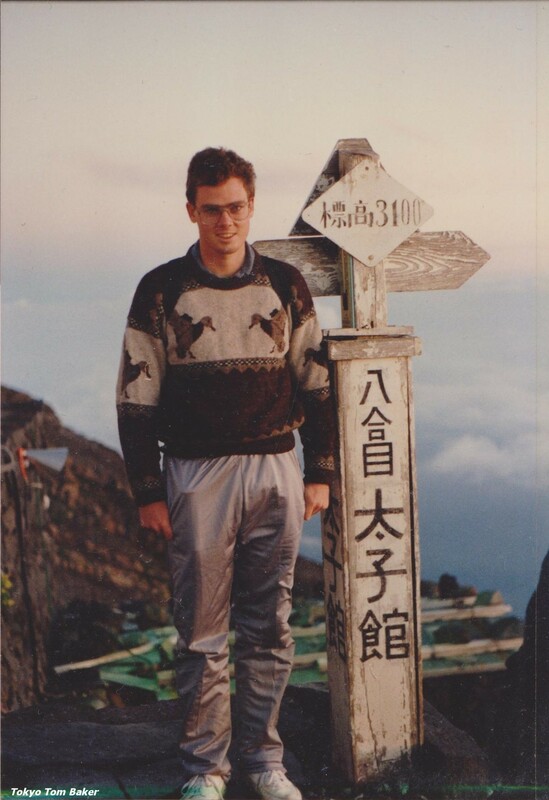 The layered look: My '89 outfit was no fashion triumph, but it got me through the climb. One thing I had learned on my first climb was to dress lightly and to carry additional layers of clothing in a backpack. What had been a warm summer day below the treeline felt like late autumn now, and the landscape was becoming appropriately more desolate. The rocks that we had to clamber over were getting larger and larger, and in some places the path through them consisted of little more than a chain or some spray-painted arrows. At this point, a cloud suddenly enveloped the mountain, and us with it. Now it was winter. For the next two hours we were very cold and very wet, and I wished I had thought to bring gloves. Still, we were better off than the next Fuji casualty we witnessed. Although he at least had the good fortune to be dressed in rainproof climbing gear, the poor man was vomiting large amounts of ramen onto the trail while a friend patted him sympathetically on the back. The five-hour mark came and went. With visibility down to a few meters, we had no idea how far we were from the top. There were no altitude markers for the last few hundred vertical meters. The climb got steeper, and the rocks became larger and more jumbled. We were exhausted. We were soaked by freezing rain. We seriously considered turning back, but having come this far we couldn’t do it. We decided to climb for another ten minutes and then decide. Ten minutes later, we decided to try another ten minutes. After climbing for six hours, we finally made it. At the summit, we found a small concrete building where a man was heating canned drinks in a pot of water over a gas flame. I bought one just to hold it against my right hand, which had frozen into a claw. (I’d kept my left hand in my pocket.) After about ten minutes I could move my fingers again, though stiffly. The drink I chose was amazake, a thick white beverage made from sweet sake dregs that is often served to children. Containing carbohydrates, sugar, and trace amounts of alcohol (about one percent), it was just what I needed. By now we were well behind schedule. As before, the five-hour prediction had proven false. We realized that dinner in Tokyo was out of the question, but we thought we could make up for some lost time going downhill. Most of the descent is made along dozens of identical switchbacks. You walk for about two minutes, turn around, and walk for two minutes in the other direction. Every turn looks exactly the same as the one before it. This goes on and on for hours until you think that you must be caught in some sort of spatial anomaly straight out of Star Trek. Unfortunately, time continues to pass even while space misbehaves. We learned this when the sun went down while we were still halfway up the mountain without flashlights. The darker it got, the slower we walked. The path is very uneven and rocky, and a sprained ankle would not have been the most enjoyable experience to have on the side of a large cold mountain at night. I began to think that it was going to take us the whole night to get down. Just as it got completely dark, we were rescued by an old Japanese man with a flashlight. It was slow going with the three of us trying to walk in the beam of one small light, but without his help we wouldn’t have made it down until daybreak. Along the way, we met a woman who really had sprained her ankle, and who was making painfully slow progress by leaning on the shoulder of a man who was much smaller than her. Luckily, an official rescue squad arrived a few minutes after we met her, and we left her in their hands. The Fuji casualties were continuing to mount. When we reached Gogome sometime between 8 p.m. and 9 p.m., the place was nearly deserted. The souvenir shops had closed and the last bus back to Shinjuku station had already left. The old man who had guided us this far seemed unconcerned at this state of affairs because it was his intention to keep on walking. It was from him that I learned the secret of those dried-apple grannies. Old people who climb Mt. Fuji are able to do it because they first went up when they were young — and have been doing so every year ever since. Denton and I, however, were too tired to accompany him the rest of the way. Instead, we caught the last bus of the night to the town of Kawaguchi-ko and took a train from there to the town of Otsuki, which is as far as we could go before the rail system shut down for the night. At this point we had the choice of sleeping in the street or paying for a hotel room. After what we had been through, the idea of soft beds and a shower was very appealing. On the bus, we met an American high school teacher who was leading students on a class trip, and who had taken two of them on a side excursion to Mt. Fuji. The class was staying in Yokohama, which has a clear and tempting view of the famous mountain. It looked so close and so easy. The teacher had lost one student — an athlete who raced ahead — and the other student, a girl, didn’t seem very happy about the prospect of sharing a hotel room with her male teacher. It would have been best for all concerned if he had chosen to pay for two separate rooms for the sake of her peace of mind and his good name. Instead, the two of them chose to spend the night in the street. After we checked in, I looked out the window and thought I saw them sitting apart from one another on the curb, in a pool of light from the train station entrance on an otherwise dark street. It looked like it was going to be a long night for both of them. So, in the course of a single day, Mt. Fuji ruined a romance, a lunch, an ankle, and probably a teaching career. And that’s just the small part I witnessed. I guess I’m lucky to have escaped with only a sunburn and a limp, both of which disappeared in a few days. To sum up my Fuji-climbing advice…. FOOTNOTE: I originally wrote this entry in slightly different form for the language-education site Webjapanese.com, which was established by my former teacher Kota Aramaki. You are currently browsing the Tokyo Tom Baker: The Blog blog archives for July, 2010.